Miriam Ofosu Appeah is the owner and founder of St. Mary’s Preparatory School in Ghana. In 1998, she took a small-business loan to build and grow her school. Today it is one of the best private, low-fee Christian schools in Ghana. She continues to expand her school and recently implemented technology-based learning. She aspires to change the face of education in Ghana. 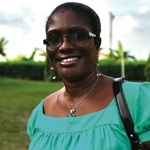 Miriam studied early childhood education at Ghana Education Services.